Our next occupational therapist is a clinician as well as a researcher in the area of return to work following an episode of depression. 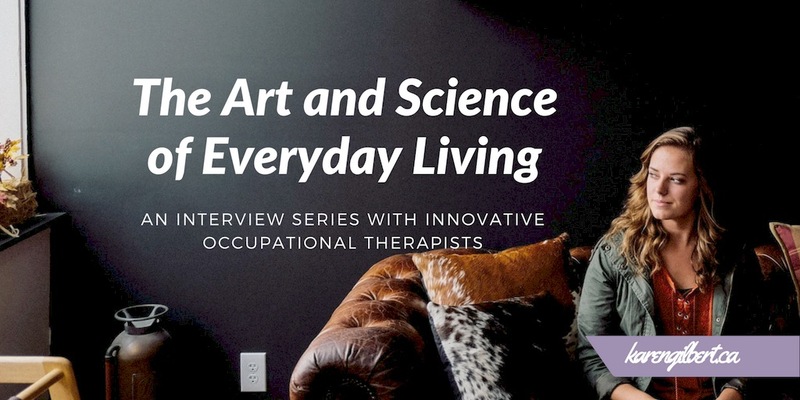 If you have an invisible health condition like depression , you may find pieces of your own story reflected in the words of the occupational therapists interviewed in this series. You may even find a tip or two to help you live your life with more ease, joy and meaning and foster a renewed sense of hope. Adeena Wisenthal is an occupational therapist who prepares people to return to work through a cognitive work hardening program (bridge2work™) that she pioneered. Through her private practice in Ottawa, ERGO-Wise, she helps clients improve their work functioning by rebuilding their cognitive abilities, increasing their stamina, and providing them with tools for improved interpersonal communication all with the goal of enhancing their ability to meet job demands thereby increasing the likelihood of return-to-work success. Adeena has helped hundreds of people return to work following an episode of depression and has been recognized by the Canadian Association of Occupational Therapists through their Award for Innovative Practice that she received in 2009. She is expanding the role of cognitive work hardening by successfully applying it to other client populations including cancer survivors and people with post-concussion. Adeena is also increasing awareness of this intervention through scholarly writing and by continuing to be a strong advocate for its unique place in return-to-work preparation. Her doctoral research confirms the program’s effectiveness with people off work on a mental health disability leave such as depression. I first became aware of Adeena’s work when I was beginning my own practice and searching for OT’s who were working independently and providing a high standard of evidence based care within a specialized niche. More recently, I came across her work again in the @ThisOTCan project during National OT Month on social media. I am delighted that she is here to share her expertise with us for this series. When I first meet clients, I ask what is holding them back from returning to work. What is preventing them from going back to work, for instance, next week? 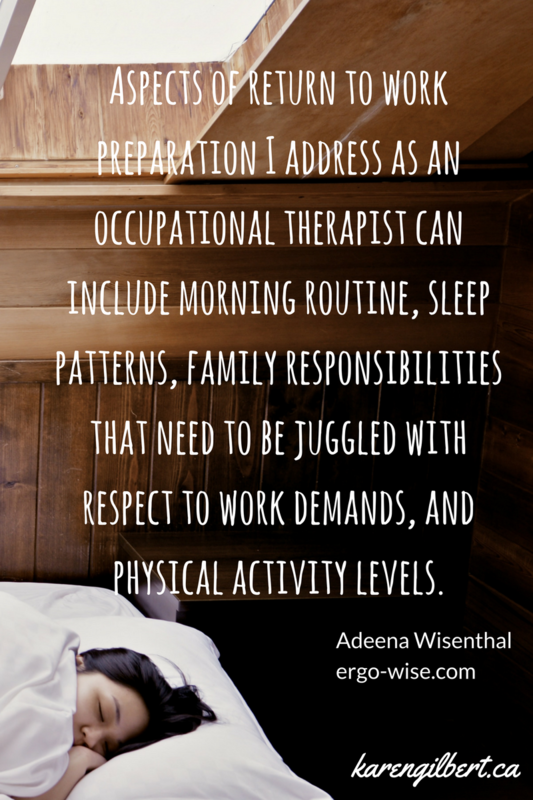 I explain how as an occupational therapist that offers cognitive work hardening, I can help them address their barriers to returning to work within my simulated work environment using a multi-faceted approach. A work schedule provides structure/routine and work simulations help rebuild cognitive abilities to meet job demands, increase work stamina and, in general, re-establish a ‘worker role’. I can also help them develop strategies to cope with work/life stressors that typically impact mental health (e.g, effective communication, organizational skills). 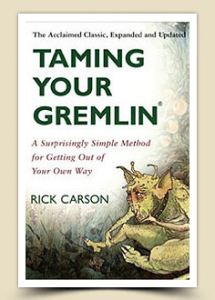 Finally, education on pacing rounds out their return-to-work preparation. Fatigue or reduced energy/stamina. Whether it is due to medication, lack of a routine, reduced activity level, overall deconditioned state (or all of these), my clients need to build up their stamina in order to be able to return to competitive employment. Reduced cognitive abilities and their capability to meet their job demands. This often includes reduced concentration, poor memory, decreased attention to detail and difficulty with multitasking. Communication typically relates to a lack of assertiveness which may have contributed to some extent to their medical leave in the first place and/or is a concern in terms of their ability to cope once back at work if the environment is a difficult one with interpersonal challenges. Pacing – Whether it is at home or once back at work, I encourage my clients to take regular breaks – even short 5 minute breaks. This helps to give their brain a chance to rest and actually makes people more efficient. Nutritional meals and healthy snacks – People need to feed their brains in order to help the brain function more efficiently. We can’t drive our cars if they are on empty. Similarly, our brains don’t work if they are ‘out of gas’. Indeed wellness and lifestyle choices are important parts of overall functioning with potential impact on work ability. 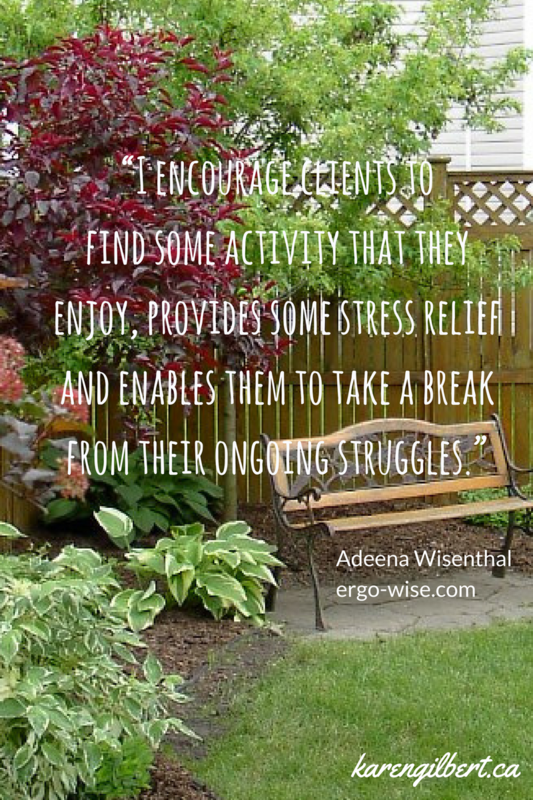 Meaningful activity – I encourage clients to find some activity that they enjoy, provides some stress relief and enables them to take a break from their ongoing struggles. People often comment about the holistic approach that I use in my occupational therapy practice. They recognize that although they have been referred for return-to-work preparation, I don’t just focus on work per se but I consider several aspects of their functioning and indeed the myriad obstacles that they have identified as contributing to their returning to work. They appreciate that this can include their morning routine, sleep patterns, family responsibilities that need to be juggled with respect to work demands, and physical activity levels. I am excited about my own research findings on cognitive work hardening that support it as an effective return-to-work intervention for people recovering from a depression. I look forward to more occupational therapists utilizing this intervention and the potential of further research in this area helping more people. My being an occupational therapist is embedded in my soul and is woven into every aspect of my life. The overarching occupational therapy principle of ‘engagement in meaningful occupation’ drives me daily to be productive and to make good use of my time. It also influences my activity choices – I understand the importance of choosing activities that I enjoy and that contribute to my mental and physical health. Being an independent person by nature fits well with the occupational therapy approach of helping people be as independent as they can be in spite of disability or limitations. While I may reach out to others for support, guidance, mentorship, and advice, in the end I strive to be independent and resourceful. Finally, seeing others’ struggles puts into perspective my own challenges and keeps me grounded and focused on everything I have to be grateful for. Working out in the gym, swimming, cooking, learning about and adopting ‘clean’ eating habits with a focus on organic foods, gardening, spending time with dogs and kids whenever I have the opportunity! Hard to stop at three! Appreciation for what I have knowing others have less. Belief that people try to do their best (even if sometimes misguided). You have to adapt (learning from my late father). There is no “can’t” in the English language (learning from my late mother). Checked off: Ran my first 5km run in support of women’s mental health initiatives and completed my PhD. Currently: Taking swimming lessons and am finally learning how to swim! To do: Offer training to occupational therapists on cognitive work hardening. Don’t give up. 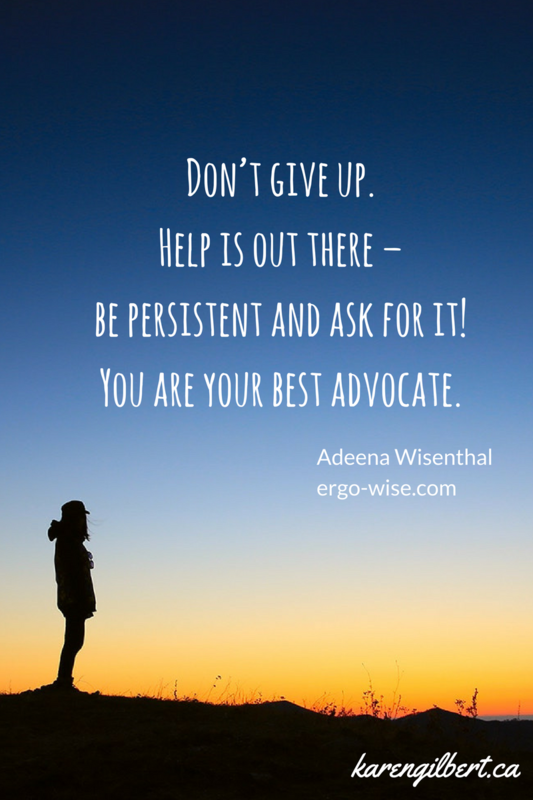 Help is out there – be persistent and ask for it! You are your best advocate. Set goals and work towards them by focusing on smaller sub goals that are attainable and can move you forward to where you want to be. Believe in yourself – life is truly a journey. Be patient. Be kind to yourself. Adeena Wisenthal PhD, M.Ed., OT Reg. (Ont.) is owner/operator of a private practice, ERGO-Wise, in Ottawa, Ontario. 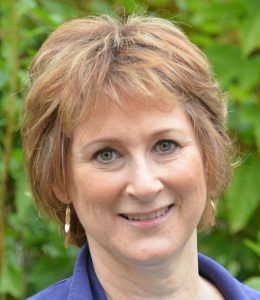 A clinician with over 20 years’ experience, she currently focuses on rehabilitation services for the workplace; in particular, return-to-work preparation. 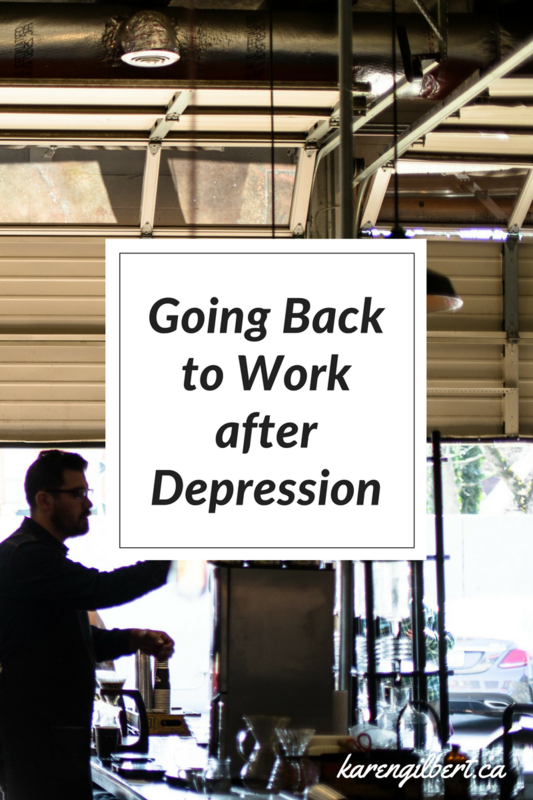 Adeena facilitates timely return-to-work for employees on a mental health disability leave (e.g., depression) or other leave that may have cognitive components (e.g., cancer survivors, post-concussion). As a clinician-researcher, Adeena contributes to the field of occupational therapy by bridging the clinical world with scientific study. She is planning on providing training to occupational therapists on cognitive work hardening so that more clients can benefit from this intervention. Visit her website at www.ergo-wise.com.